Will the new baby muck up the family dog’s way of life? The pooch sure thinks so. For years, the orange corgi and Mommy were inseparable, having fun and sharing hugs and life’s experiences together—alone. Of course a wrench got thrown into the works when Mommy met an interloper: Daddy. So much for exclusive cuddling with Mommy after that. Worse, after a while, time and space in Mommy’s lap are seriously compromised as the aforementioned sitting area becomes way smaller. And then…there is only room for Baby. To top it all off, Mommy and Baby grow very close. Guess whose life starts to go downhill, what with being scolded and ignored and having to put up with a noisy, smelly, untrained newcomer in the house? The dog’s eventual realization that the infant has become rather canine (crawling on all fours, anyone?) leads to the realization that there’s a very endearing place for a dog in the family’s new pecking order. 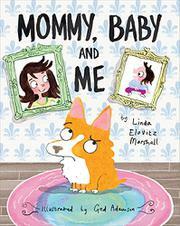 This story adds nothing new to the familiar dog-adjusts-to-new-baby canon, but it’s narrated by the dog in first, er, person in simple and sweet prose, and it also nicely stands in for many young readers/listeners who may have become new older siblings themselves. The colorful, cartoony illustrations are lively and expressive, with the white parents and infant portrayed with bright smiles and large eyes; the narrator is particularly expressive and winsome.